Cyrus Darius, ridden by Brian Hughes. Kelso Racecourse will be honouring Malcolm Jefferson, the Cheltenham Festival-winning trainer, by naming a race for him on February 14’s Morebattle Hurdle Day. Jefferson, who died just over a year ago, aged 71, is sadly missed by the northern racing fraternity. His four Cheltenham Festival wins came with Dato Star, Tindari, Cape Tribulation and Attaglance. 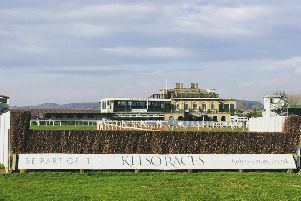 Notable successes at Kelso Racecourse included the track’s two most prestigious hurdle prizes in 2017. He took the Premier Novices Hurdle with Mount Mews and the Timeform Morebattle Hurdle Race with Cyrus Darius – the horse which provided daughter Ruth with her first winner, last year, in the same race. Run in previous years as the Ivan Straker Memorial Chase, the £25,000 steeplechase was won last year by Lucinda Russell’s Big River, owned by the Two Black Labs, whose distinctive colours include a silhouette of a black labrador. Big River is being aimed at the race once again. 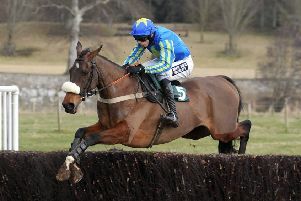 Feature race of the day is the £30,000 Timeform Morebattle Hurdle. A trial for the Champion Hurdle at Cheltenham, it was first staged in 1988 and was made popular by Jinxy Jack, who gained four wins in a row for the late Gordon Richards between 1990-93. In 2010, Zaynar, one of the highest-rated horses ever to run at Kelso, suffered a major shock when beaten at odds of 1/14 at the hands of Quwetwo. Brian Hughes has become the jockey to follow, as he’s won four of the last six renewals, including the last two with Cyrus Darius. In 2016, Top Notch was successful for Nicky Henderson and the five-time champion jumps trainer is considering running We Have A Dream, who runs in the same green colours of Simon Munir and Isaac Souede. The French-bred gelding is being aimed at the Champion Hurdle and was a Grade 1 winner at Aintree’s Grand National Festival last spring. Other races on the seven-race programme, which boasts £100,000 of prize money, include a £10,000 Novice Hurdle, a £14,000 Novices steeplechase and an Open Hunters Steeplechase, which could well be targeted by Pacha Du Polder – winner of the last two runnings of the Foxhunter Steeplechase at the Cheltenham Festival.